Tonight I met a friend at Sweet Pepper (385 Boston Post Rd.) in Sudbury. I’m not a big Thai food person but I love Pad Thai. 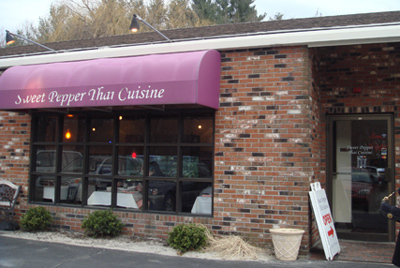 Since there are no Thai places in Framingham, it’s been a while since I’ve had that dish, so when my friend asked me to meet here here I was more than happy to get my fix. It’s kind of small inside but “cozy” and nicely decorated. We started off splitting fresh garden rolls that had carrots, red and green lettuce, vermicelli noodles, chicken and shrimp. 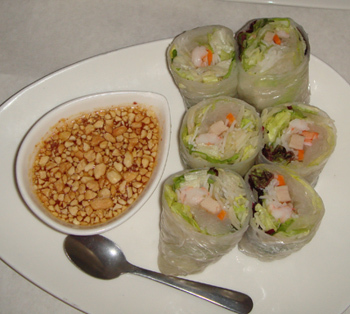 With the rolls, a sweet and slightly spicy peanut sauce was served on the side. They were light and tasty but no too filling. We both got the tofu Pad Thai (so I only took one picture) This was really good although in the back of my mind I always compare Pad Thai with “Eriwan of Siam” in Waltham makes an incredible Pad Thai, it’s hard for others to compete with. This did hit the spot though and I’m not aware of any Thai place closer than going to Waltham so I would probably go here again. Plus the service was friendly and well timed. 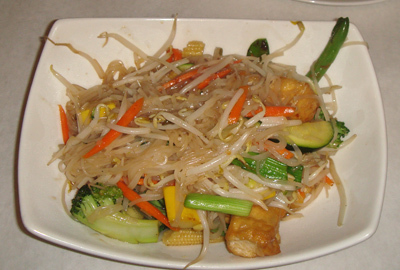 Another good local Thai restaurant is Morn’s in Wayland. Big fan of Treetop in Waltham. Harder to find than Erawan’s, but better food for a better price.